Soare sekt went from a favorite children’s champaign to becoming the Czech Republic’s second largest producer of sparkling and still wines. A LABEL SELLS. Wine-maker Jindřich Sobota and his brother-in-law Roman Žďárský know this business rule very well. More than that, they know how to make use of it. When choosing a bottle of Merlot for a party or a Cabernet Sauvignon for a romantic dinner, how would a label featuring a painting by famous Czech artist Alfons Mucha affect your decision? That is what both entrepreneurs considered when they approached the painter’s grandson, John Mucha, who manages his family’s heritage, and negotiated an unlimited license (in the field of winemaking) to Mucha’s paintings. The idea to combine good quality wine with art nouveau paintings – “Grands Vins d’Alfons Mucha” – occurred to Sobota and Žďárský, founders of Soare sekt, in 2001 when their already successful company decided to enlarge its portfolio to include still wines. The same year Soare sekt, the second largest Czech producer of still and sparkling wines, bought about 16 hectares of vineyards. Soare sekt imports wines from many countries, including Austria, Hungary, Slovakia, Spain and France, and today its stock includes numerous brands and wine varieties. 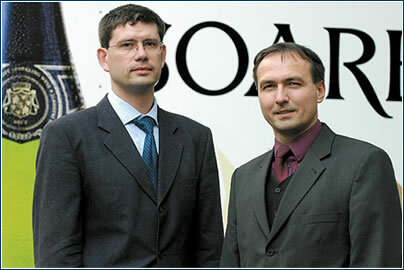 Sobota and Žďárský started their career as winemakers in 1991 with production of carbonated wines. Their start-up enterprise was based on a good idea and CZK 20,000 of initial capital inherited from Sobota’s grandmother. A year later, the two fresh graduates realized that the market lacked a high quality children’s beverage for festive occasions. But it took another nine months before the company introduced a fruit juice-based carbonated drink with a recipe created in cooperation with the Research Center for the Packing Industry. The friends persuaded a now-defunct leasing company to finance the risky enterprise, including a television campaign worth CZK 1 million for a new product with an original name – Rychlé špunty (“Quick Cork”). In 1992 Soare’s total debt amounted to CZK 5 million. The young entrepreneurs outsourced production of the first lot from České vinařské závody. However, in mid-November, several weeks before the product was scheduled to hit shop shelves, the big firm backed out of the contract saying that it had no equipment for such production. “We had one week to equip our premises in order to hand-make the lot,” says Žďárský. 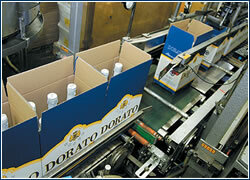 Along with Sobota he organized a three-shift production to manufacture about 10,000 bottles per day. Although about 50% of the first lot went to Germany, total sales did not cover all expenses. “We assumed that by the end of the year we would sell up to 500,000 bottles, but actually sold only about 300,000,” recalls Žďárský. 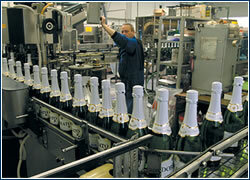 The friends did not give up, however, and even increased production to up to 750,000 bottles per year. Time for a change came in 1995 when Soare sold a 42% stake to German concern Sektkellerei Schloss Wachenheim (the firm presently holds a 52% stake). 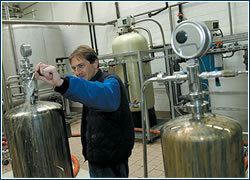 The strong partner made an investment and helped get a bank loan to buy new production equipment and technology. 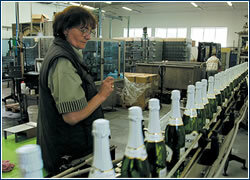 Several years later the company’s annual production reached 10 million bottles, and annual turnover had increased ten times. Currently the company has about 140 products on its price-list under about eight trademarks, each with its own budget and a strategic marketing plan. Soare invests up to 10% of its CZK 450 million annual turnover into advertising. The marketing mix for particular trademarks includes television commercials, billboards, advertisement in magazines, PR articles in newspapers, and lots of promotional activities, such as tasting events at supermarkets. “Now we are trying to establish ourselves in independent shops as well,” notes Žďárský. About 20% of annual sales go for export, with Slovakia accounting for around half of this figure, and Russia coming in second. Soare products are also sold in 20 countries all over the world, including Germany, the Baltics, Vietnam, and South America. The Czech Republic’s accession to the EU, and subsequent abolishment of custom duties, opened the door to cheaper, quality wines from other countries, like France, Italy, and Spain. “EU accession means a lot of pressure from foreign competitors,” acknowledges Žďárský. He points out that Czechs consume about 160 million liters of wine per year, yet local vineyards produce only about 50 to 60 million liters. And while the majority of foreign wine was imported in barrels and bottled by Czech producers, from now on the share of bottled imports will increase. “We are trying to establish relations with foreign producers, to distribute their wines in the Czech Republic using our sales force,” says Žďárský. 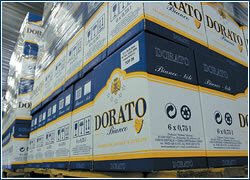 Currently production accounts for 85% of the company’s annual turnover and distribution covers the remaining 15%. This ratio will likely change in the future, with the share of distribution increasing. 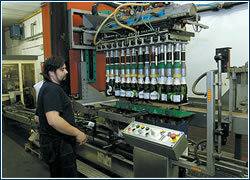 Over the coming years, Soare has plans to increase sales to 20 million bottles per year. A trademark is an artSoare devotes a lot of thought and effort to establishing each of its trademarks on the market. Rubby Bubble and Grands Vins d’Alfons Mucha were successful thanks to an original idea supported by strategic marketing. In order to promote the upscale Mucha brand wines, Soare organized several wine-testing events and cooperates closely with restaurants. “We prepared a wine menu for those restaurants that serve Mucha wines, provided special training to their staff as well as special glasses, table cloths, corkscrews and outfits for sommeliers,” says company co-founder Roman Žďárský. Another popular trademark, Vineria, benefitted from a wine test published in the popular daily Mladá fronta Dnes. Soare also co-sponsored a special event in the European parliament in Brussels, presenting Czech and Moravian cuisine and supplying its wines to the event. Timely suppliesDuring the first years of Soare’s existence, sales of wines did not completely cover expenses. So the entrepreneurial founders of the company discovered an additional niche to keep the firm afloat. They started producing and selling utensils for wine-makers. “We researched what wine-makers used abroad and found out that these products cost several times more than Czech wine-makers were ready to pay,” recalls co-owner Roman Žďárský. Immediately Žďárský and his brother-in-law Jindřich Sobota contacted local factories and ordered parts for such utensils as labeling machines, injectors, baskets, and other items that were not available on the market. The assembly of these goods was mainly accomplished by staff working at home, including housewives formerly employed at the traditional jewelery industry in the Jablonec region, where the workforce was abundant, due to the decline of said industry.